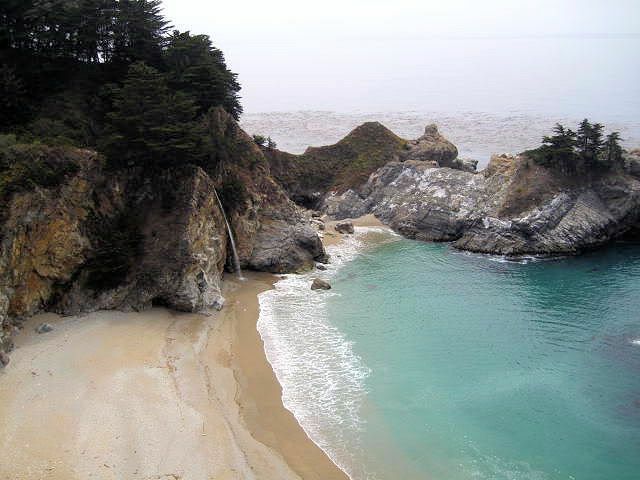 McWay Falls, located at Julia Feffier Burns State Park. This is one of my favorite beach scenes. This is only my second time seeing it but it never fails to leave me breathless. The beach is protected and there's no way to get down there safely, except perhaps by kayak. There were some idiots who decided to climb the barrier and start down the very steep mountainside...in flip flops! I would feel no remorse if they got poison oak rashes or a broken leg. We told a ranger about them, I hope they got a huge fine! Gorgeous, I love the waterfall and it's only an easy 5 minute walk from the parking lot.